When Christmastime comes around in the West everyone knows it—surviving the season without hearing “Jingle Bells” at least once would require a communications blackout for at least a month. But if any Scrooges among us are hoping to escape the unwanted well-wishes of jolly strangers by taking a vacation in China, they’ll want to rethink their destination. The Christmas spirit has been on the upswing in China since the 1990s, especially that most essential part of the holiday mood: buying things. Why the seasonal cheer? Let’s start with recent news: last month the Chinese beat out America to become the largest economy in the world in terms of Purchasing Power Parity (PPP), according to the International Monetary Fund. Don’t panic, America—you still hold the top spot in overall GDP, which is generally more important, but, if the PPP figure is accurate then China is now number one in buying power. And that is one quite important reason that Santa Claus has put China on his route. In fact, Santa Claus is actually the main figure of the Chinese Christmas season, as opposed to the tradition’s origins around the birth of Christ (or the sun, depending on your preference). This is perhaps even more fitting, as Christmas Eve in China is equivalent to Black Friday in America— according to Kang Wei, a department store director in Taiyuan. Most Chinese, even those who celebrate Christmas, are hardly aware of the Western tradition’s roots. Instead, the festive tradition—which still comes with the lights, the music, and the gifts—has become a joyous occasion centered around the fact that the growing Chinese middle class is getting used to its disposable income. And you don’t need to know much about reading charts to know that the one below is showing that the average Chinese citizen has gotten better off quite rapidly. Ever since 1978 (when the above chart technically starts), when the Chinese government began to institute more economically liberal policies, Chinese consumption has been increasing. This is due both to their disposable income and some encouragement on the government’s part. They introduced two “Golden Weeks” in 1999—one around Chinese New Year and one around National Day—giving people paid time off in an effort to boost consumption and travel. These weeks worked quite well, but Christmas Eve and Christmas—days which are not actually national holidays, as the government is not overeager to embrace such a Western tradition—have arguably become just as popular. This is an interesting political development in a country that has been trying to strengthen Chinese national culture for quite some time, and is certainly a bit indicative of the level to which capitalism’s power in China is outpacing the government’s. 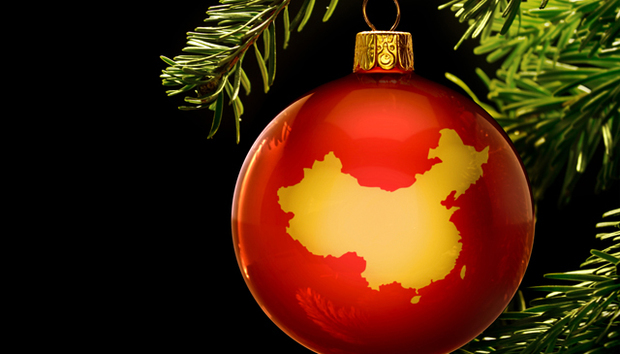 Some conservative Chinese still see it as a threat, and back in 2006 a group of scholars wrote an open letter to the government suggesting that Christmas should be phased out. In fact, Christmas was officially frowned upon until the 1990s, though that did not stop both Hong Kong and Macau (both semi-independent Chinese entities) from celebrating it as a legal holiday. Valentine’s Day, also a significant commercial holiday in China, has not met with quite the same opposition, though Singles Day (held on November 11th, 11/11, as a celebration of Chinese bachelors and bachelorettes) has become wildly popular, which may say something about the state of romance in China. Santa Claus might even be thought to look a bit like the Chinese Buddha—the famous, suspiciously jolly, rather chubby statue that so many mistake for being the actual Buddha. In fact, that particular statue is one of the Buddha’s followers, named Maitreya, who was apparently quite good with children. It’s fairly easy to see how that cultural translation might have gone well, though I should note that this is pure speculation on my part. Apparently elves are not quite the Chinese thing though, as the Chinese tend to surround Santa with his typically youthful and attractive sisters. And for some reason, he really enjoys playing saxophone. Similar to the West, Christmas is also that time of year when regular and irregular churchgoers alike flock into the sanctuary. Though most Chinese are not aware of the holiday’s Christian connotations, those who are (67 million, or 5% of the country’s population, by The Pew Foundation’s 2011 estimate) take it fairly seriously. Though recently the Chinese government has been cracking down on private churches—only government churches are allowed—and there are reports of worsening repression of Chinese Christians, their numbers continue to grow. At least, their estimated numbers do—margins of error may be high due to the large number of underground practitioners. There is a fairly substantial list of countries who tried to take the economic benefits while minimizing the cultural impact, but for better or for worse, globalization tends to be a package deal. Thomas Friedman’s famous “Golden Straitjacket” concept states that if a country wishes to be economically viable in the global economy, it needs to subscribe to certain global norms of a privatizing state. China’s current leader, Xi Jinping, seems to be just enough on the side of acceptable economic reforms to balance out his conservative political stance, having circulated a secret memo in 2012 stating that the Western values of “constitutional democracy,” “universal human rights,” and “civil society” were dangerous. So for all the Scrooges out there, don’t fear—China’s government still says “Bah! Humbug!” along with you on the whole Christmas issue. But given the growing imbalance of power between their government and its economy, Christmas will probably continue to get bigger rather than smaller in the world’s most populous country.